Highlights this year include Malian superstars Amadou & Mariam, the hip Yemeni harmonies of A-Wa, reggae legends The Abyssinians, Tuvan throat-singing legends Huun-Huur-Tu, and underground favorites like House of Waters. Latin-inspired dance music pioneers Nickodemus and Captain Planet will pack the dancefloor, after a day-long exploration of world traditions with classical masters like Amjad Ali Khan and psychedelic roots from Thailand, thanks to Khun Narin. Other performers will include Deya Dova, Random Rab, Whitebear, Youssoupha Sidibe, and Phaeleh, among many others. This year, in addition to a compelling lineup of global musicians and DJs, the festival will host a bevy of cross-cultural collaborations, and some world premieres. Bay Area Latin club maverick Quantic is teaming up with the passionate pan-Latin sisterhood of Fémina for the very first time. House of Hamsa heralds a new incarnation of cult World band Hamsa Lila’s North African trance, thanks to live looping and transformation by Heavyweight Dub Champion. Workshops will highlight musicians and their life stories, shining a light on some of the pressing social justice issues on Americans’ minds. Rahim AlHaj and Las Cafeteras will unpack the nuances of border imperialism and sanctuary via their very personal experiences as members of immigrant and refugee communities. Beloved’s musical and educational offerings are expanded by a wide array of serious yoga instruction, held in a dedicated hall with high-quality sound. Additional workshop topics will include Yoga & Movement, People, Plants & The Planet, Music Culture, as well as Art and Youth-centered workshops via its largest family presenter team to date. For full lineup and tickets, go to https://belovedfestival.com/. 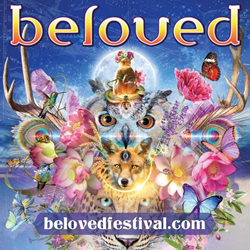 Beloved is a 4-day camping, art, and music festival on the Oregon Coast. The event intends to present sacred music to help eradicate the illusion of separation from each other, from the earth and from The Beloved. The greatest aspiration of this festival is to engage the hearts and minds of those present in the finding of The Beloved in each other; and furthering our ability to cooperate to make that appreciation tangible on earth. Its goal is to dissolve the boundaries that isolate us through music, dance and play.